Parents have an "odd life," and Disney’s new family film The Odd Life of Timothy Green brings this to life on the big screen. A parent's life is odd. We get this odd opportunity to shape a human being for a short time. When you think about it, our only real prerequisite for having this distinctive thing of childbearing take place is to be a male and a female living on the planet earth. We bring our preconceived notions, the way our parents did things, and the lame stuff our friends tell us into this bowl and mix it up for a few years. A very few short years. By the time they go away to college, you have a person, and hopefully, after a few years of care and love and teaching, you have person who is mature and grown. You love this person, and you’ve shaped and molded this tiny person into a bigger one through cheesy gold fish and sliced hot dogs. After spending all of this time and money and worry and sacrifice, you learn it’s just starting when you send your prized possession to college. It’s really an odd life for parents. When my wife mentioned that she might be pregnant -- “might” because you’re never really certain with the first pregnancy until several pregancy tests later -- I just didn’t believe it really happened. It’s quite magical, really. The moment after you realize you or your significant other is pregnant, your mind shifts into parent mode. Seriously. Your mind takes you places you didn’t previously know about. You now have a parent brain. You dream about the gender and whom he or she will look like in the family. You dream about he or she acting like you or your spouse. You worry about things you never even thought about before you were a parent. Before the baby came, do you remember all the worry and anxiety and stress over all the things that could go wrong? Parents have a worry continuum. That contiuum goes from wanting a child, to being pregnant and worrying about said child. This worry and stress, I’m told goes on until the end, with peaks during the high school and college years. But the odd life of parents is that you learn, as Jim and Cindy Green learn in the film, your kids aren’t really yours. You're just overseers who take care of those little ones on their journey. Whether you promise yourself as Jim does in the film and vow to, "...do things different than my dad" or you make silly parenting mistakes, you really are there to love and care and cherish the children given to you. The rest is not up to you. It’s an odd thing, the life of parenting. From counseling your teen in relationships, to teaching them sports and music and love and life and death, we parents have been entrusted with something special, a very odd life. This new family film from Disney will make you relive your parenting mistakes and triumphs and inspire you to cherish the moments you have with your kids. They grow up fast and leave the house, when the real worry and odd life continues. 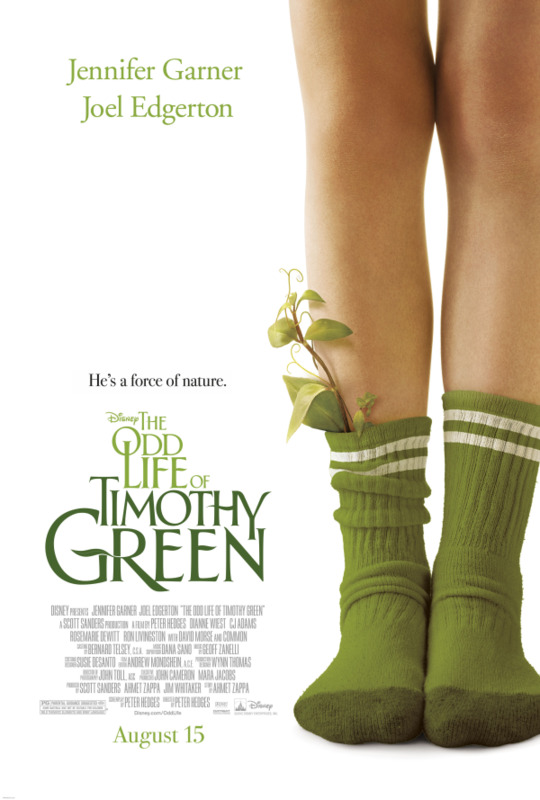 For more on Disney’s new family film, visit our Timothy Green page.